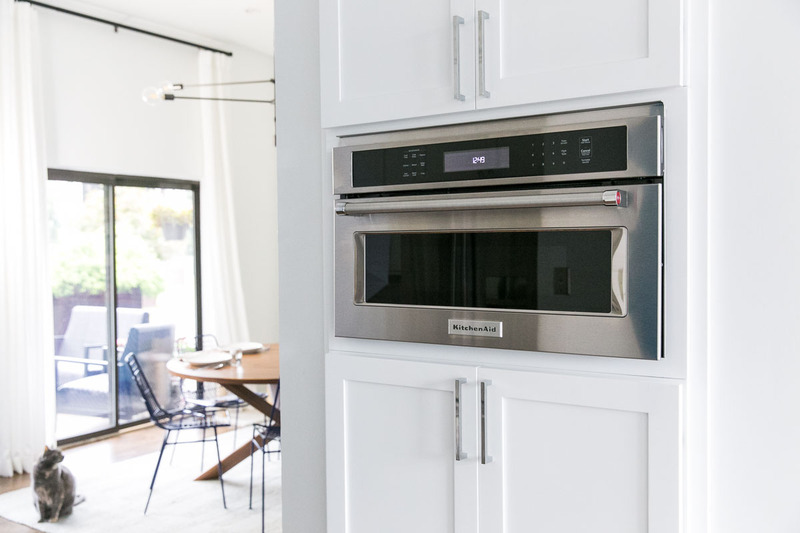 It’s convenient to leave your most beloved appliances right on the kitchen counter; however, doing so can sometimes be an eyesore. 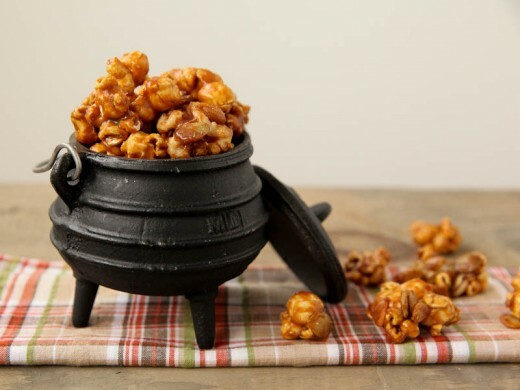 The solution isn’t to tuck these “go-tos” away in your crowded cabinets. Rather you can incorporate your countertop appliances into your kitchen décor, leaving your counters looking pretty without sacrificing function. Here is how. Don’t hide ‘em, flaunt ‘em! Your first inclination might be to try to camouflage your countertop appliances; however, they are often large and not easy to hide. I say if you’ve got ‘em, flaunt ‘em! Pick pretty appliances in a color that will pop. My kitchen is mostly white. 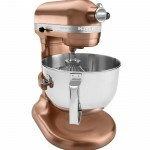 I chose the KitchenAid® Professional 620 6-Quart Stand Mixer in Satin Copper because I thought it would really pop against the white marble backsplash and white cabinets. As you can see, I let my mixer shine in my kitchen. It actually serves as the anchor to the rest of my kitchen décor. 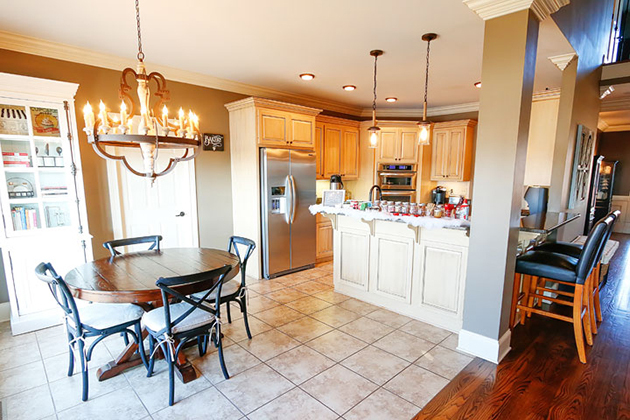 To make this look seamless, it’s important to repeat the color of your appliance in your décor. 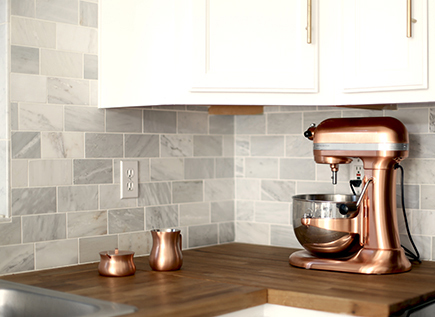 I added a few copper accessories to my countertops to carry the look throughout the kitchen. Get creative with this, but don’t go too wild. One or two matching accessories will do. Don’t be afraid to mix your metals. It is often thought to be a faux pas to “mix your metals.” However, I am here to tell you it is quite all right and actually on trend. Mixed metal kitchens are popping up all over Pinterest. I incorporated brass hardware to round out the mix of copper and stainless steel in my kitchen. I think it turned out quite nice. Since appliances are machine-like and usually metal, bringing in some greenery to your kitchen provides a nice contrast. Succulents are great if your kitchen is lacking in light. They are tough little plants that aren’t easy to kill. My countertops are sprinkled with succulents. Aloe is a nice one to have on hand. It has some great healing elements for those annoying oven burns. Now go out there and enjoy your newfound freedom in your kitchen. No more pulling appliances in and out of the cabinet!